I really detest all labels in terms of Metal. And I have strong and logical reasons to feel this way. Because labels stigmatize a band's work, and sometimes, do not reflects the reality of what they are doing. Yes, sometimes, when you'll label a band, maybe you're killing their efforts to become a great name in the future. A part of bands really have a strong and bold personality that a simple label can't describe the totality of their musical work, and the Finnish quartet BLACK .44 is one of them. 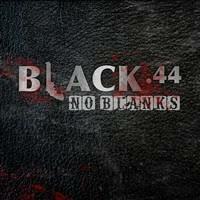 Besides they are labeled as a melodic Stoner Metal/Rock, "No Blanks" is an album that really is far beyond this label. I dare to say that their music is melodic and full of energy, staying far from those Stoner band that uses a dusty and raw sound quality. No, here everything is clear, with very good musical arrangements, and their musical influences aren't locked in the past. No, some parts sound modern and abrasive, but they have also some more melodic and musically accessible parts. In their case, the best thing to do is to hear and take your own conclusions. The vocals are very good, using a fine diversity of tunes; the guitars are doing an excellent work on the riffs, and the rhythmic kitchen is doing a fine job, guiding the tempos and giving the band a good musical range, and this all is fused to create a fine kind of music. The sound quality they got is very, very good. Their music sound clean and heavy in the due proportions, creating something that sound aggressive and full of energy, but with clearness to understand what the band is playing. The energetic and powerful "Overcome" (with some modern touches and very good use of vocal tunes' variations), the almost commercial song "Into The Grace" (it's accessible, but the harsh tunes used on guitars and some screams can give the opposite idea), and the slow and bitter "Born Wrong" can be said as their best moments, besides the album is entirely very good. This band has a future!